This is an astonishing book. Unlike most memoires in American letters, Pete Fromm has given us a book of big, one might say existential questions. A searching book providing few answers, but asked by someone who has experienced life--and death-- on the edges. This is a book of fathers and sons, legacies and letting go, time and mortality. The prose is spare. Not quite prose poetry but it holds more weight than most contemporary writing. An absolute joy to read, Pete Fromm will make you laugh, then just as quickly break your heart. The book moves seamlessly across time and space; youthful hubris, to a man in early middle age in awe of the power of love and the realization at how quickly the things that matter to us can be wrenched away. Chances and fate; choices and the realization that it is over all to soon. Just like this book--over all too soon. 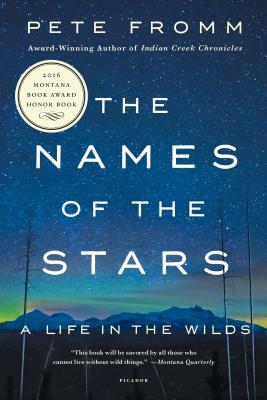 From the Author of Indian Creek Chronicles and the Winner of Five PNBA Awards, Pete Fromm’s New Memoir Sees His Return to the Wilderness to Explore a Life Lived in the Wilds. Twenty-five years after his beloved memoir Indian Creek Chronicles, Pete Fromm was asked to return to the wilderness to babysit more fish eggs. No longer a footloose twenty-year-old, at forty-five, he was the father of two young sons. He left again, alone, straight into the heart of Montana’s Bob Marshall Wilderness, walking a daily ten-mile loop to his fish eggs through deer and elk and the highest density of grizzly bears in the lower forty-eight states. The Names of the Stars is a trek through a life lived at its edges. From loon calls echoing across Northwood lakes to the grim realities of lifeguarding in the Nevada desert, through the isolation of Indian Creek and years spent running the Snake and Rio Grande as a river ranger, Pete seeks out the source of his passion for wildness, while exploring fatherhood and mortality and all the costs, risks, and rewards of life lived on its own terms.